Wildlife Caution: All wildlife is potentially dangerous and may be encountered at any time. Animals that lose their fear of people and become habituated to human food and garbage are especially dangerous. Bears are particularly unpredictable. Never approach or feed bears or other animals. Store and dispose of your food and refuse so wildlife, especially bears, can't get it. Use facilities provided. Please don't leave garbage at isolated sites. For more information on bear safety, click here. 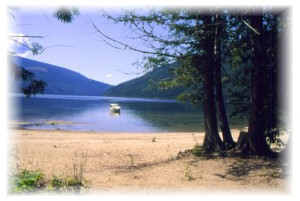 Marine Park Boundaries: The boundaries of all marine parks on the Shuswap Lake are marked with blue and white signs on the beach. Fees apply anywhere within the park boundaries including the 100 metre foreshore. Restrictions: Fees are in effect for all overnight use including camping, beaching, docking, mooring and anchoring within 100 m, May 1 to September 30. Boaters overnighting in marine parks must purchase camping permits in advance (except Cinnemousun Narrows and Silver Beach). Permits are sold at most marinas and tourist information centres and at Cinnemousun Narrows and Silver Beach. Explosives (fireworks) are prohibited in British Columbia Provincial Parks. Cinnemousun Narrows Park and Marble Point: Houseboats must not be beached between the signs on the southerly side of Cinnemousun Narrows or between the signs at Marble Point during the period of May 15th to Labour Day. Silver Beach Park: Houseboats must not be beached between the signs indicating no houseboats. Quiet time begins at 11 p.m. Visitors are requested to refrain from late night parties, excessive noise and loud music. Note special fishing regulations for Shuswap Lake. You will need a British Columbia Angling Licence if you plan to fish. Please refer to BC Environment Fishing Regulations Synopsis. 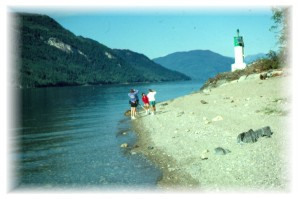 Navigation and Travel Tips: The shoreline of Shuswap is not complicated and does not require refined navigational skills. Boaters should be able to use a chart and compass in the event of reduced visibility due to fog. As an aid in night sailing, permanent lights with distinctive colours and flashing rates have been placed at various points. BC Parks assumes no responsibility for unserviceable lights. For navigation purposes, all boaters should consult the most recent Canadian Hydrographic service chart, available at most marinas. Major shallows are shown on the map but others may exist. Use caution when running close to shore. Approach slowly when coming ashore due to the presence of offshore sandbars. Lake levels can drop five to ten centimetres daily during the summer. Wind and weather information can be obtained by tuning radio stations broadcasting from Kamloops (CHNL 610 KHz; CHNL 107.2 Mhz, CFJC 910 kHz; CBUFM 105.7 Mhz), and Salmon Arm (CKXR 580 kHz; CBUC 880 kHz). The lake can be quite rough during high winds. Mooring and Float Use: Some sites do not have protected beaches. During stormy weather, it is advisable to beach your boat stern first and secure it with long ropes from the bow to pegs on the shore. This will prevent waves from breaking over the stern and filling your boat. Houseboats should be beached according to instructions provided by the rental companies. Docks are provided in some areas for small craft only. Please do not tie houseboats to these structures. Water Safety: An approved life jacket or personal flotation device must be carried for every person onboard. All passengers and crew should familiarize themselves with the characteristics and methods for use of this equipment. Prolonged immersion in cold water causes hypothermia or a lowering of the internal body temperature. This condition will result in death unless reversed. Familiarize yourself with modern techniques to revive victims of reduced heat loss in water. Never give alcohol to a victim of hypothermia. Use blankets and, if the person is conscious, administer warm liquids and warm, moist air for breathing. Garbage: Please take your garbage with you from the lake to an authorized disposal site. This park is where the four arms of Shuswap meet. This park is one of the most popular stopping places for all lake users. On the northern side of the lake there is a small camping area containing 4 sites and a docking wharf. On the southerly side is a 24 site camping area with several shelters and a beach suitable for swimming or sunbathing. A 1.5 km hiking trail leads from the campground to a vantage point overlooking the lake. This location accessible only by boat. 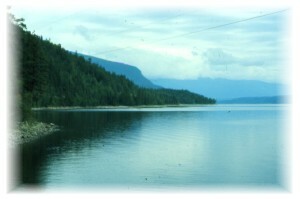 Located at the northwest end of Shuswap Lake Main Arm, near Anglemont. There is a pit toilet located across the road at the east end of the park. There are no other facilities at this location but random camping is allowed. Safe anchorage. Caution! Watch for rocks off the point. Located at northwest end of Shuswap Lake Main Arm. Road access. Pit toilet at this location with no other facilities. There is a gravely beach in this location. This location can be accessed by both road and boat. 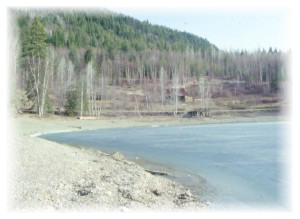 This is an undeveloped camping area located at the northwest end of Seymour Arm. Some areas are road accessible. Camping is only permitted in specific areas � Please obey all signs!A trail that begins near Steamboat Bay follows Celesta Creek upstream approximately 1.5 km, then crosses the creek and returns to the lake. Noted for a series of beautiful waterfalls and some interesting features from early logging days. Bears are frequent visitors in this park. CAUTION! This trail has some steep, rough sections with sharp drop-offs. Children should be closely supervised and pets kept on a leash. Serious injury and deaths have occurred in this area due to adjacent waterfalls, changing water levels, fast currents and cold water. 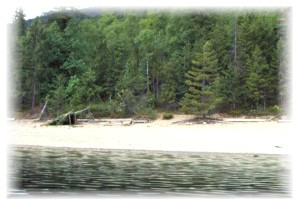 Located on a south-facing point on the east side of Seymour Arm. No facilities provided. Wide sandy beach for picnicking. This location is accessible only by boat. CAUTION! This area is subject to strong winds and is not safe for overnight moorage. Located approximately 1/3 of the way up the east side of Seymour Arm. There is a small gravel beach. No facilities provided. This location is accessible only by boat. Located approximately 1/2 way up west side of Seymour Arm. There are five rustic sites and a pit toilet. This location is accessible only by boat. Located at the northwest end of Seymour Arm. Small, sandy beach, with a pit toilet but no other facilities. This location is accessible only by boat. Extends north from Cinnemousun Narrows along east side of Seymour Arm. Wide gravel beach. No facilities provided at this location. This location is accessible only by boat. 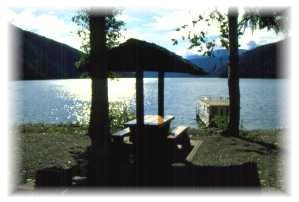 This park rests in an attractive setting of Douglas fir and aspen at the head of Seymour Arm. Supplies are available nearby and there is vehicle access. CAUTION! Shallow sandbars occur in front of the main beach. A safer, deeper area for approach and mooring is to your right along the shore towards Bughouse Bay. Located approximately 2/3 of the way up the west side of Seymour Arm. There are five wilderness campsites in an attractive forested setting of Douglas fir, hemlock and birch. Pit toilet. Picnicking. This location is accessible only by boat. Located approximately 1/3 of the way up the west side of Seymour Arm. Small gravel beach with no facilities at this location. This location is accessible only by boat. Located just south of Woods Landing on the west side of Seymour Arm. No facilities at this location. This location is accessible only by boat. Located on the east side of Seymour Arm, across from Encounter Point. A pit toilet is at this location but no other facilities are available. There is a small gravel beach. This location is accessible only by boat. Located along northwest side of Anstey Arm. No beach or facilities at this location. The 2.5 km trail to Hunakwa Lake begins at Anstey Arm West. Beaching at the trailhead is difficult being shallow and rock – only small boats should attempt it. This location is accessible only by boat. Located at the north end of Anstey Arm. There are five rustic campsites and a pit toilet. There is a large cedar and cottonwood forest at the mouth of the Anstey River. CAUTION! Shallow sandbars require a cautious approach. In late summer, boats cannot reach the shore. 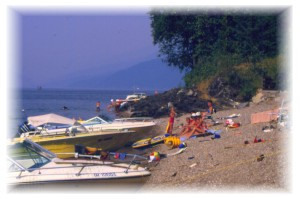 Do not beach boats for extended periods without compensating for dropping lake levels. 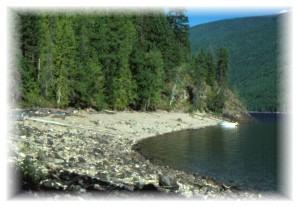 Anstey-Hunakwa Protected Area includes a variety of landscapes at the north end of Shuswap Lake. It extends from the shore of the lake to alpine environments on mountain tops. There are extensive areas of old-growth forest in the Engelmann, Spruce-Subalpine Fir and Interior Cedar-Hemlock zones. 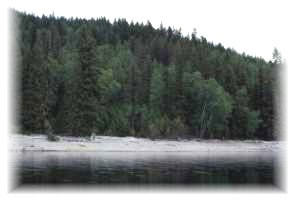 Included in the park are two lakes that cannot be reached by road (a rarity in the Shuswap area) - Hunakwa Lake and Wright Lake. The north end of Anstey Arm is more accessible (but only by boat), and is valued for its recreational opportunities (sandy beaches) and salmon habitat. Extends north from Cinnemousun Narrows along the west side of Anstey Arm. There are five campsites and a pit toilet. Excellent view up Anstey Arm from this pleasantly forested site. This location accessible only by boat. The beach is a mix from sand to larger rocks. Located on the east side of Anstey Arm. There are seven wilderness campsites and a pit toilet. A sparkling creek, tiny bay, and majestic cedar-hemlock forest make this site special. This location is accessible only by boat. The beach is a mix from sand to larger rocks. Located at the southern end of the site called Anstey Arm West. This location has small bays. There is a pit toilet, but no other facilities. This location is accessible only by boat. The beach area here is gravel. Sheltered small beach area across from Anstey View. Sheltered bay with a sandy beach and a marked swimming area. A pit toilet is at this location but no other facilities. NO fires are permitted on the beach. CAUTION! Large offshore rocks at south end. This location is accessible only by boat. Located on west side of Anstey Arm, north of Anstey View. No facilities. The beach is a combination of gravel and larger rocks. This location is accessible only by boat. Located on the northwest side of Salmon Arm. No beach or facilities. This location is accessible only by boat. 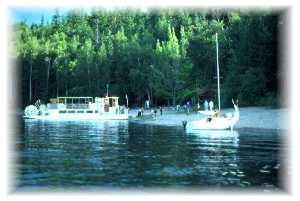 Facilities include a campground, picnic ground, over 1,000 metres of mostly sandy beach and a boat launch. 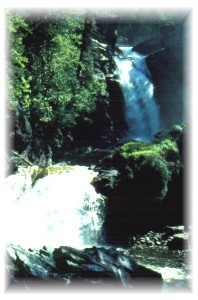 Upstream from the developed area is Margaret Falls, an attractive cataract that is reached by a short walk over a wooded trail. Mooring of boats overnight is not permitted. 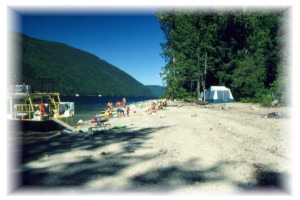 Located on the northwest side of Salmon Arm and has a small gravel beach. There is a pit toilet but no other facilities at this location. 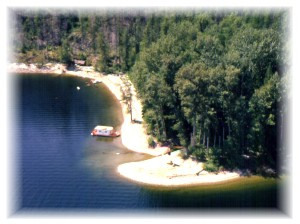 Located on the northeast side of Salmon Arm this location has a small gravel beach. There is a pit toilet but no other facilities at this location. This location is accessible only by boat. Located just north of Hungry Cove on Salmon Arm. 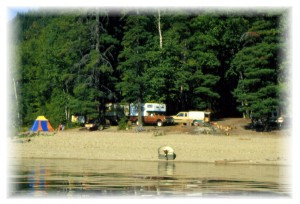 There are 16 wilderness campsites and a gravel beach. Pit toilets. Houseboats must not be beached between the signs east of the point during the period of July 1 until Labour Day. Unique marble outcroppings are visible from the lake. A pleasant trail through lush cedar-hemlock, carpeted in deep moss, links the north and south camping area. Visitors can see an abandoned mine shaft, a relic from the past. This location is accessible only by boat. Located on the west side of Salmon Arm, near Herald Park. Pit toilet. Gravel beach. This location is accessible only by boat. Located at the northeast end of Salmon Arm, near Cinnemousun Narrows. Small sandy beach. No facilities at this location. This location is accessible only by boat. Located just north of Hermit Bay on the northwest side of Salmon Arm. No facilities at this location. This location is accessible only by boat. Located on the west side of Mara Lake with gravel beaches. Pit toilet and no other facilities. This location is accessible only by boat. Return To Shuswap Lake Marine Provincial Park.